Meg Whitman is the president and chief executive officer (CEO) of eBay, Inc., the online auction site that became one of the World Wide Web's most surprising success stories. She took over the position from its founder, Pierre Omidyar, who remains active in the company, and has guided it into a commercial enterprise on a par with Amazon.com. Unlike other online sites, however, eBay enjoys impressive profits, thanks to its "virtual" presence. In essence, there is no warehouse, no sales staff, just a brand name and a collection of servers that connect buyers and sellers. In her posistion at eBay, Whitman is the first woman to become a billionaire thanks to stock holdings in an Internet company, and she freely admits that she learns as she goes. "Every week, there is a different set of issues, a different challenge, something new to think about," she told Business Week writer Robert D. Hof. "Probably at least a couple times a week, I go, 'Huh! I didn't know that.'" 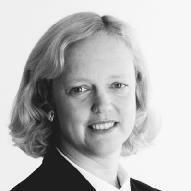 Margaret "Meg" Whitman was born in 1957, the youngest of three children. She came from a well-to-do clan with ties to some of Boston's oldest families, and grew up in Cold Spring Harbor, a posh waterfront community in Long Island, New York. Her father, Hendricks, had his own loan business. Her mother, also named Margaret, was a homemaker, but when Whitman was in her teens her mother traveled to China as part of a women's delegation that had been invited for a visit. This was in the early 1970s, and the Asian nation had been closed to foreigners for many years until that point. Though Whitman was still in high school, her mother's achievement was an important part of her life. "When my mother came home after this great adventure," Whitman recalled in an interview with Christian Science Monitor journalist Patrick Dillon, "she told me what this experience taught her. She realized she could do anything she wanted and she wanted me to recognize that I could do the same." "We're a different company every three months. I ask myself from top to bottom, do we have the right people in the right place at the right time ...? I even ask myself if I'm the right person for the right time." Whitman was a talented athlete in high school, serving as captain of her swim team. She also played field hockey, lacrosse, and basketball. She entered Princeton University in 1973, just a few years after it began admitting undergraduate women for the first time. Planning on becoming a doctor, like many academic successes in high school she was tripped up by her organic chemistry class, among other courses. "I took calculus, chemistry, and physics my first year," she explained to Fast Company writer Charles Fishman. "I survived. But I didn't enjoy it. Of course, chemistry, calculus, and physics have nothing to do with being a doctor, but if you're 17 years old, you think, This is what being a doctor is going to be about." Whitman found her niche at college when she took an advertising sales job for a student magazine. She switched her major to economics, and after graduating from Princeton in 1977 went on to another Ivy League school, Harvard, where she earned a master's degree in business administration. In 1979 she was hired at Procter & Gamble, the Cincinnati, Ohio-based household and personal care products maker. One of her colleagues in the brand management department was Steve Case (1958–), who later founded America Online (AOL). August 1999: Auction for human kidney reached a bid of $5.7 million before eBay removed it for violating sales policy. 2001: Gulfstream II jet sold for $4.9 million, thought to have been the most expensive item ever sold on the site. June 2003: "Ghost in Jar" from Arkansas; winning bid: $50,922. April 2004: Seattle man sells ex-wife's wedding dress after posting pictures of himself wearing it; winning bid: $ 3,850. Other unusual auctions: lump of coal; piece of navel lint; a Lincoln Continental sedan once owned by President John F. Kennedy; boyhood home of former U.S. president Bill Clinton in Hope, Arkansas. While at Procter & Gamble, Whitman worked on the Noxzema skin care products team, but did not stay long at the company. She had married a Harvard medical student, Griffith Harsh IV, and because of his residency in neurosurgery, the couple had to relocate to San Francisco. There, Whitman found a job with Bain and Company, a global management consulting firm. She also became a mother during the 1980s, and her next job was a child's dream: that of senior vice president for marketing consumer products for Disney. She helped launch the company's new theme stores outside the United States, but began looking for a job in New England when her husband was offered the post of chief of neurosurgery at Massachusetts General Hospital in Boston. Fortunately, a shoe maker called Stride Rite in Lexington, Massachusetts, was looking for a new president. During her time at Stride Rite, Whitman oversaw the revival of its vintage Keds sneaker line. Her next job was with Florists Transworld Delivery (FTD), a cooperative of florists, as president and chief executive officer, but she stayed only a year before going over to Hasbro, the toy maker. Not surprisingly, it was a decision that thrilled her young sons. Whitman ran Hasbro's preschool toys division, and successfully re-launched another vintage product, Mr. Potato Head. In the fall of 1997 Whitman was contacted by a headhunting firm, which conducts searches for executives and other key corporate personnel. An online auction company was looking for a new leader to help launch it in earnest, but she had never heard of AuctionWeb, as eBay was still known. But Whitman agreed to fly to California for an interview. Before she left, she did some computer research on the company, when AuctionWeb was still a collection of classified ads. "I remember sitting at my computer saying, I can't believe I'm about to fly across the country to look at a black-and-white auction classified site," she recalled to Fishman. EBay was still a relatively young company. It was started in 1995 in San Jose, California, by Omidyar, a computer programmer. He created the site and its software as a way to help his girlfriend sell items from her collection of kitschy Pez dispensers. The buy-and-sell by auction concept, in which the highest bidder wins, took off, and Omidyar's site turned a profit six months after it was launched. Its premise was simple: seller posts an item for sale and accepts auction bids over a two-week time frame. The highest bidder wins, and the buyer and seller exchange address information for payment and shipping. EBay charged a thirty-five-cent listing fee, and also took a small percentage of the sale transaction. One of eBay's most important features was a rating system by which buyers and sellers rated their transactions with one another. Negative comments—about buyers who had not paid or sellers who had not shipped—would make others wary about doing business with either. Omidyar was convinced that listening and responding to the site's user base was crucial to his company's success. The online rating system itself had been suggested by eBay aficionados, for example. But he was having a difficult time expanding the company and maintaining his ethical outlook, and decided that a professional executive might do a better job in expanding eBay, as it had been renamed. Omidyar and the others in charge liked Whitman's customer service experience and brand management talents. She, in turn, liked eBay's sense of community spirit. Whitman talked to her family, and they agreed to move. 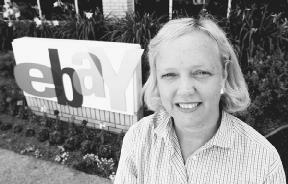 She started the job at eBay in February of 1998. The company had just nineteen employees at the time, and some were still using card tables as desks. Whitman delved in, taking a cubicle office like everyone else and even heading into fearsome high-tech territory. In June of 1999, with the company's site becoming more popular on a daily basis, its servers crashed for twenty-two hours. They had gone down before, but engineers had been able to find the problem quickly and fix it. This time was different. Whitman showed up at 4 A.M. and, as she told Atoosa Rubenstein in a CosmoGirl! interview, "moved in with the engineers for three months and effectively ran the technology division. I didn't know very much about technology, and it was a bit like being in France—everyone is speaking French, and I don't!" Whitman also oversaw eBay's initial public offering (IPO) of stock in September of 1998, and over the next five years helped eBay become one of the most unusual success stories in American business history. It grew faster than Microsoft, Dell, Amazon, or Wal-Mart, and proved so successful for its sellers that many began quitting their day jobs in order to concentrate full-time on their online auctions. Heavy eBay pros were taking in $100,000 a year in sales, and some part-timers were helping to put their children through college with the extra income. EBay was said to have boosted the fortunes of an immense number of small specialty stores like antique shops and t-shirt makers, simply by giving their Web-savvy owners a whole new nationwide customer base. Margaret Whitman poses outside of eBay headquarters in San Jose, California. what worked and what did not. She even sold the contents of her family's Telluride, Colorado, ski lodge. She also checked in regularly with the site's message boards to see what users were discussing. "The great thing about running this company," she told Brad Stone in Newsweek, "is that you know immediately what your customers think." Under Whitman, eBay began holding annual member conferences for its top auctioneers. She is usually greeted like a rock star when she takes the stage, with the audience chanting her name. Honors have come from other sources, too: in 2002, Fortune magazine named her one of the three most powerful women in business. By then, eBay had over thirty million registered users, and took in $1.1 billion that year on a sales total that reached $15 billion in completed auctions. A year later that figure had risen to $24 billion in goods and services, and revenues had doubled to $2.17 billion. At any given time on eBay, about twenty million items are up for sale. Ten million bids are submitted by users every twenty-four hours, with $900 worth of goods and services exchanging hands every second. Whitman has an annual salary of $2.19 million, but thanks to her ownership of eBay stock she is thought to be the first female billionaire created in the Internet age. She has donated some of her fortune to Princeton University, where she sits on the school's board of trustees. In early 2002 she and her husband donated $30 million to help the New Jersey school build a new residential college for undergraduates. Whitman College would be Princeton's sixth residential college, and would house about five hundred students. The added space would increase enrollment at Princeton from 4,600 to 5,100 when its first classes begin entering in 2010. "I had a great time as a Princeton undergraduate," a report in Ascribe Higher Education News Service quoted Whitman as saying, about her reasons behind the gift. "The University inspired me to think in ways that have guided me throughout my life." Whitman works hard to balance her family life with a job she loves. She works out in the morning, and is usually able to drive her two sons to school. Vacations are often spent skiing or fly-fishing. When she travels for business, she rarely flies on the company plane. Thanks to the numerous business magazine covers that have featured her, fellow fliers recognize her and tell her their eBay stories. "I have one of the best jobs in Corporate America," she enthused to Hof. "It's this unique blend of commerce and community. The community of users is endlessly interesting and endlessly surprising. That's what I love the most." Bannan, Karen. "Sole Survivor." Sales & Marketing Management (July 2001): p. 36. Dillon, Patrick. "Peerless Leader." Christian Science Monitor (March 10, 2004): p. 11. Fishman, Charles. "Meg Whitman." Fast Company (May 2001): p. 72. Hof, Robert D. "'The Constant Challenge' at eBay.' Business Week (June 30, 2004). This article can also be found online at http://www.businessweek.com/technology/content/jun2004/tc20040630_3302_tc121.htm . Hof, Rob. "Meet EBay's Auctioneer-in-Chief." Business Week (June 12, 2003). This articles can also be found online at http://www.businessweek.com/technology/content/may2003/tc20030529_8665.htm . Horsburgh, Susan. "EBay's eBoss." People (August 4, 2003): p. 97. "Meg Muscles EBay Uptown." Fortune (July 5, 1999): p. 81. "Meg Whitman to Support New Residential College at Princeton." Ascribe Higher Education News Service (February 4, 2002). Stone, Brad. "Meg Gets on the Line." Newsweek (June 17, 2002): p. 56. Rubenstein, Atoosa. "Team Player." CosmoGirl! (April 2003): p. 108. Did you know about this woman? One of truly great business leaders. Impressive cradentials and track record. From my view, it will be unusual for her to win in California not being a lawyer; or they who monopolize politics and most top level positions in the government. If she could win California, her biggest task will be to change the system from confrontational to real problem solving, then there are the old saws; those pettifoggers who polute the system for their own personal interests. Good Luck Meg! While I do feel that Ms Whitman has an interesting and commendable history, it is hard to see her blatantly doing attack ads to essentially buy the election while people are struggling so much in this country. I wish she would have been thinking creatively to find a way to help the immense problems of California by investing this money in ways to create jobs. 100 million dollars could have helped a bunch of people. I cannot understand what Ms. Whitman fears from Jerry Brown. Her entire media ad policy seems to be aimed at bashing Brown. If he is so qualified, why should she fear him? I do not find opponent bashing very informative if the candidate. Ms. Whitman has said nothing thru the media that would be aimed at gaining my vote. Too bad that winning isw her main goal and thus she has to stoop so low as to make inaccurate statements, dig up quotes from over 40 years ago and in general be less than truthful.. And that is supposed to gain my confidence and eventually my vote? HAH!